At Invisible Children, we don’t typically think of ourselves as cartographers. But, in reality, something called “Community Mapping” is a huge part of what we do. In the same way that almost all of us rely on Google Maps to get us where we’re headed, our Invisible Children teams and the local leaders we work alongside rely on Community Mapping to make decisions on how to make communities safer. The process helps us understand the unique needs, assets, and perspectives within each individual community. It’s an important step which ensures that local perspectives and ideas are always at the center of our programs. Our Invisible Children team is constantly traveling to remote corners of central Africa where we seek out and meet with local leaders to literally create a map of their communities. But it’s also a lot more than drawing out roads and landmarks. 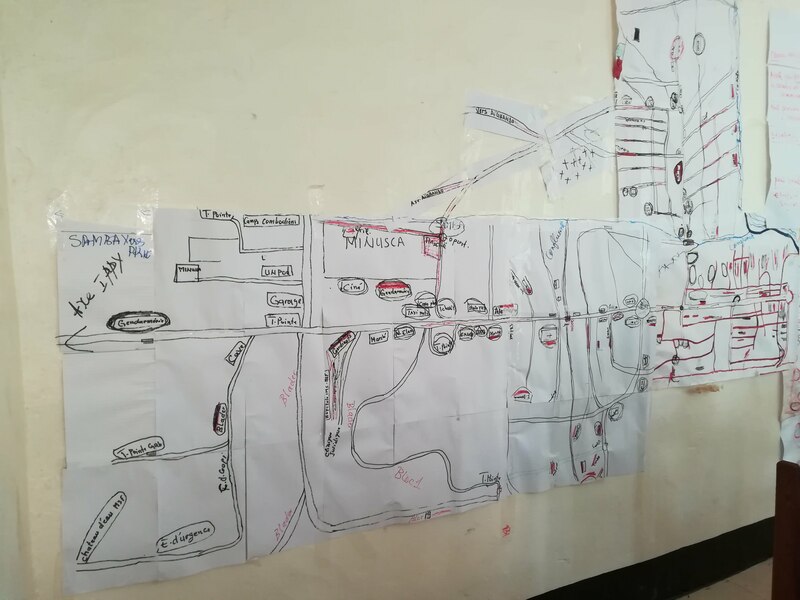 Answering these questions through a participatory mapping exercise helps communities to create a Community Action Plan which is a key component of our Early Warning Radio Network. With a Community Action Plan in place, local communities are prepared to respond to information about security threats that they receive through the Early Warning Radio Network in ways that help reduce their vulnerability and keep families safe. Why is it important to ‘map’ communities? First, every community is unique. While many face many of the same kinds of challenges, no two communities are exactly the same. Each community faces a unique set of challenges and they all have their own, unique assets that can be leveraged to reduce their vulnerability to violence. By getting to know a community, its members, and its situation, we can more effectively help them work toward improving their safety and preventing violence. Second, it’s important to identify community needs together with communities themselves. The community members that we team up with are the people who know their community best. They know what the people in their community need most and what their community has to offer. That’s why it’s so important to ensure that community members, not Invisible Children staff, lead the community mapping process from the very beginning. Through Community Mapping, we’re able to bring local leaders’ expertise on their communities together with our team’s expertise in preventing violence. Finally, collaboration is key to success. Community mapping gives our team the opportunity to collaborate with communities, but beyond this, the process is an excellent opportunity for people to recognize their community as a whole and to unite around the shared goal of improved safety. We gather leaders from across the community, including members of different ethnicities, religious groups, ages, and lifestyles to map their community together. This helps reinforce the importance of working together, across differences and helps ensure that the voices of even the most marginalized members of communities are heard. Whenever you’re doing something that matters, you have to start from the beginning. That’s what we do through the community mapping process. By taking the time to get to know communities and let them get to know us, we’re starting off from a place of strength and trust that helps make everything we do — from expanding the Early Warning Radio Network, to forming and training Peace Committees, to helping families heal from trauma — have a greater impact. JOIN US. DONATE TO ENSURE THAT OUR PROGRAMS CONTINUE TO HAVE A GREATER IMPACT IN CENTRAL AFRICA. The programs described in this post are made possible by the support of the American People through the United States Agency for International Development (USAID). The contents of this post are the sole responsibility of Invisible Children and do not necessarily reflect the views of USAID or the United States Government.